We are the Central Kentucky chapter of Kentuckians For The Commonwealth, and we believe that all Lexington’s workers deserve a wage that can sustain themselves and their families. UPDATE (July 7): The Minimum Wage Ordinance has been recalled from the Budget, Finance and Economic Development Committee and is going to the full council! There will be a council discussion session on August 20, 4 p.m. in the council chambers (200 E Main St). 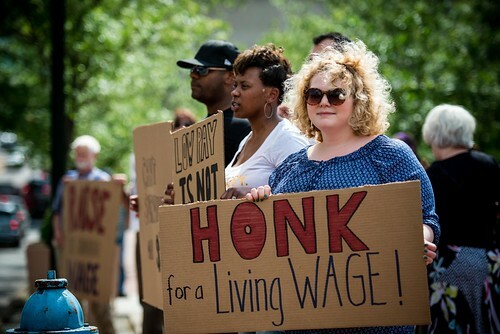 Central Kentucky Chapter members are pushing forward to raise the minimum wage in Lexington, in the face of their city council members tabling the ordinance at the last Budget and Finance Committee hearing on June 23 for the Lexington-Fayette Urban County Government. 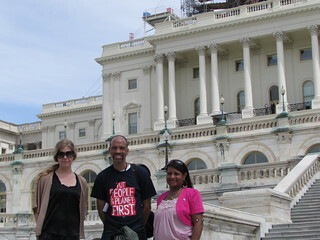 So far, it has been a summer of KFTC members and our allies in the Working Families Coalition building momentum by rallying, lobbying, writing op-eds, and giving testimony at hearings, and the chapter has no intention of backing down. CKY Members and allies are planning to gather this Tuesday evening, July 7, at 6 p.m. at the LFUCG Council meeting to push for the ordinance to be heard by the entire Council in August after a summer recess. Two rallies in Lexington have already been organized and carried out by chapter members and our allies this summer, the most recent on June 23 in Phoenix Park prior to the LFUCG Budget, Finance, and Economic Development Committee hearing. After the rally, supporters marched to the Budget and Finance Committee hearing. Lexington Fayette County Urban Government is considering raising the minimum wage and the Central Kentucky KFTC Chapter has been hard at work moving the campaign forward. The ordinance being considered would raise the minimum wage to $10.10 for hourly employees and $3.09 for tipped workers. Both rates of pay would be increased over a period of three years. After three years, the minimum wage rate would be tied to inflation.